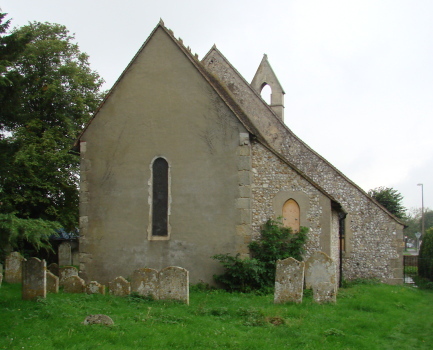 A small C11 two-cell church, with C13 lancets and a C19 north aisle. Rumboldswyke was incorporated in Chichester in 1893 (VCH 4 p171), though it had always been in the Dean’s peculiar and as late as the C14 may have been a chapelry of St Pancras (SAC 74 p67). 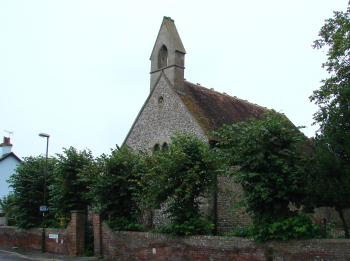 The centre of the parish moved after the building of the railway in the 1840s and in 1901-02 a chapelry of St George was built to serve the newly built-up area. This rapidly became the parish church in all but name and St Mary’s was finally made redundant in 1994. Until 1866 it consisted only of a nave and chancel. The fabric is C11 and though no original window remains, the Sharpe Collection drawing (1804) shows a narrow round-headed north doorway. The material is mixed flint and rubble work, including re-used Roman brick, of which there is said to have been more before the restoration of 1866 (Fisher p168). The quoins are large and the walls are only about 2ft thick (Taylor and Taylor p525). These would be grounds for placing the work before the Conquest, but there are stronger reasons for dating the whole structure to rather later in the C11. These include herringbone masonry in the chancel (which was never extended), whilst the plain round-headed chancel arch is built of large blocks of stone and it lacks through-stones. Though clearly C11, its breadth argues against a pre-Conquest date. J Tavenor-Perry’s claim (in Mundy (ed) p66) that a chancel arch of Roman brick was removed around 1890 must stem from confusion with Westhampnett. 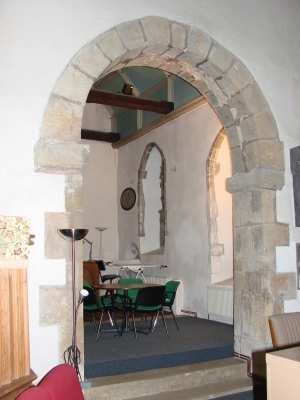 Early C13 alterations included lancets and a large pointed and chamfered recess of uncertain purpose in the north wall of the chancel, which was adapted in the C19 as the entrance to a vestry. The almost round head of the east lancet, in particular, confirms an early C13 date, though the form of the rere-arches of the nave lancets, which are not concentric, though they lack proper scoinsons, might suggest a date a little later in the century. Unusually, the chancel has only one east lancet, possibly because it directly replaces an earlier one. Of the two in the south chancel, the western one is a lowside. A plan of the church before the vestry was built (SAC 21 p40) does not show any north lancets, though a smaller reset one in the arch that now leads to the vestry, said to have come from there, may still have been concealed at the time when the plan was made. 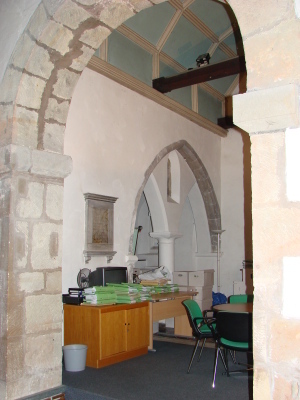 The nave also has lancets (only one on the south side and, as the Sharpe drawing shows, also on the north side) and a continuous roll-moulded pointed south doorway. The Burrell Collection drawing (1785) shows also a segment-headed west doorway and a large pointed window below a boarded bell-turret with a pyramid cap. The last is probably co-aeval with the visible main roof timbers, which look C14 or C15, though some have been repaired. Otherwise, the nave roof is plastered. In 1866-67 G M Hills added a north aisle in C13 style (B 25 p136), re-using the original north west quoins of the nave. The capitals of the arcade have curious wavy ornamentation. Hills also replaced the chancel roof with the present panelled one and provided a pair of west lancets with a stone bellcote above in place of the customary boarded belfry on the Sharpe drawing. In 1884 (CDK 1884 pt 2 p155) the vestry and organ chamber were added, entered through a double arch that derives from those at Boxgrove and is set in the north recess in the chancel. After it was made redundant, the church was adapted as the offices of the then diocesan architects, C Mercer. 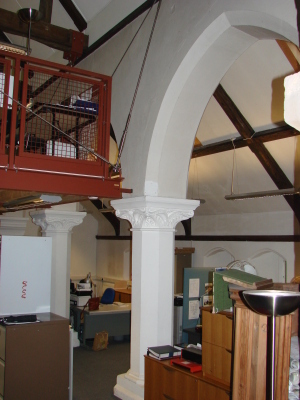 The alterations included a steel mezzanine floor, which is suspended from the nave roof timbers. This is a remarkable testimony to the strength of the surviving timbers and is designed to be fully reversible should the church ever be needed for its original purpose again. The practice of Clive Mercer has now been merged to form HMDW Architects Limited which continues to use the church. Font: (Now gone) C19 with a plain round bowl. Monument: (South of chancel arch) Edward (d1818) and Frances Maxwell (d1828) by J Bacon junior (i e S Manning) (Roscoe p52). It consists of a plain tablet beneath a book and presumably dates from after 1828. 1. (South nave wall) C13 plain pointed, but the bowl has been restored. 2. (Chancel south wall) C13 round-headed, incorporating a C11 baluster shaft of unknown provenance. Stoup: (East of south doorway) C13 trefoil-headed, lacking bowl. My thanks to Simon Dyson of HMDW Architects Ltd for giving me access and giving me much information on the present use of the church and the process of adaptation.